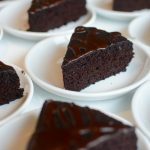 As more people turn to veganism, I think it’s useful to have a few vegan dessert recipes in your repertoire to accommodate the dietary needs of your vegan loved ones; and this one’s a winner! It’s velvety and rich without being cloyingly sweet and unduly dense, which means you eat a slice of it without the regret of having done so afterwards. 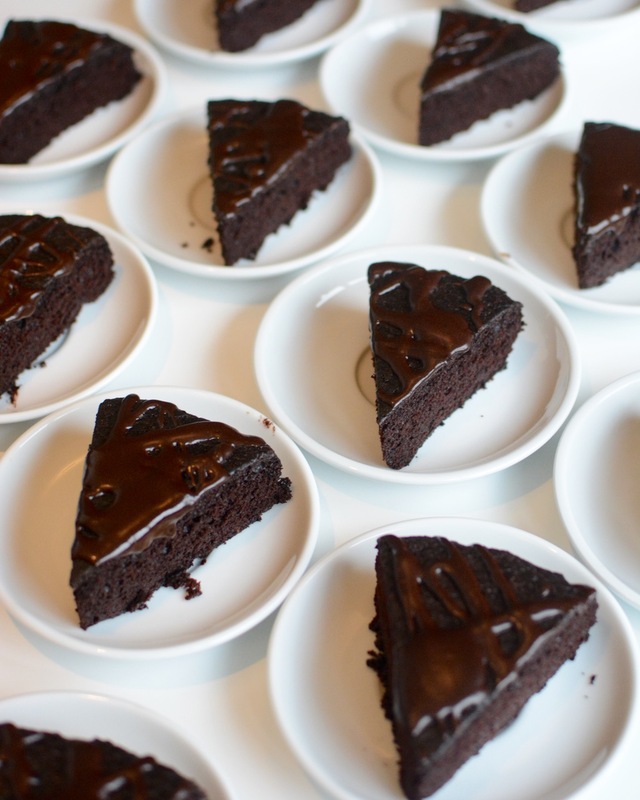 We’ve all eaten dense cakes whereby, almost immediately after, it sinks it’s way into our stomachs like an iron anchor. In the absence of butter, cream or eggs you can delight, guilt-free in the comforting glow of chocolate like being swaddled in cocoa-colored luxury cashmere. Velvety, rich, decadent and surprisingly vegan. Prepare a 9″ cake pan with a piece of baking parchment. I often don’t bother cutting the paper to fit the pan since I plate the slices of cake, instead of presenting the cake in its entirety. Typically, I take a piece of baking parchment, which I buy the precut, and mold it into the pan, folding and creasing the paper ensuring that the parchment makes contact along the surface of the cake pan. I’ve made a habit of greasing and dusting the pan with cocoa powder, though most certainly you can skip that step. Sift the flour, sugar, cocoa, baking soda, espresso powder and salt in a medium mixing bowl. Then, add the oil, vanilla, water, and vinegar to the bowl and whisk the batter into a smooth amalgamation of chocolate goo. Pour the batter into the prepared pan and bake on the center rack for 30-35 minutes, or until a toothpick poked in the center of the cake comes out clean. Remove the cake from oven and allow to cool for 10 minutes before removing it from the pan. Allow the cake to cool completely before drizzling the cake. Once the cake is cooled, make the drizzle by whisking the powdered sugar, cocoa powder, vanilla and water in a small bowl or larger measuring cup until smooth. I find a measuring cup works especially well for this because it has a spout, which makes pouring and drizzling much easier. When the mixer smooth, pour it over the cake however you like. I often will decorate the cake by pouring it directly from the measuring cup as well as by allowing the chocolate to ooze from the whisk in which I used the mix it. Surprisingly, this cake does taste better the day after you make it. That is ,if you can wait that long.